My artist style is a combination of traditional and modern elements. As a former watercolor painter, I combine my Asian influences with Western aesthetics in an east-meets-west style. Bold, luxurious ''statement pieces'' are my specialty. Those items that are not only elegant, but excite a double take and just stops all eyes when one wears them. My pieces are made using both wire work and colorful gemstone beads. As a former trained artist, I love paintings and art work, especially landscape and fauna paintings by Monet, Asian artists, and Impressionism in general. I design each and every jewelry piece as the three dimensional product of a two dimensional painting. 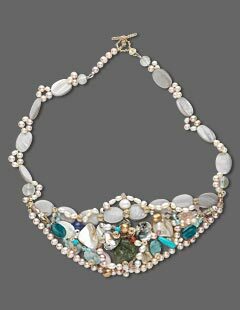 Multi-colored gemstones, freshwater pearls, turquoise, and base metal, sterling silver and 14kt gold-filled wire. I love the color turquoise. To me, it is vibrant, happy and soothing. When I designed this piece, I wanted to design a beautiful but simple garden of flowers that can be worn on a person. 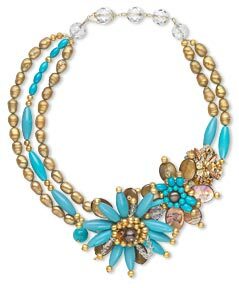 Turquoise and gold are a regal and extremely flattering color combination. There are a couple of steps in my design process. First, like a mosaic artist, I lay out all the beads on my special cloth covered table to make a flower arrangement. After that comes the artistic vetting process, where every shape, color, and bead is changed or arranged by my artistic intuition into a design that makes me happy and satisfies my aesthetic. Once the two top steps are done, I use both Zebra Wire and Accu-Flex® beading wire to knit and create a strong foundation for the gemstones. Lastly, 14kt gold-filled wire and other garnishes are added to the surface design for a multi-layered, impressionistic effect. Throughout this process, I pay special attention to how things look worn on a live person. To me, jewelry must flatter the wearer and be practical in a woman's wardrobe. Necklaces are modeled standing in front of a large mirror, in a variety of outfits and poses, with a premium put on design. 17 years ago, my husband was a graduate student at Indiana University at Bloomington and we lived there. A friend was relocating with her family to another state, and sold me her wholesale bead and trinket business. I begin to play with the beads and findings to create small, simple designs. Those small designs were first sold at a University art gallery. From then on, through practice and pure enjoyment, my pieces kept getting bigger, designs more courageous and my quality level in workmanship and materials both improved, gaining me more and more customers. My friend, who sold me the bead business 17 years ago, was the first person to introduce me to simple wire work and beading. 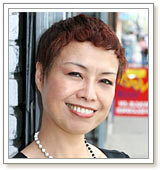 From then on, I studied and experimented myself over 17 years to create new and interesting designs. When I was young in Shanghai, China I studied water color painting and commercial arts design for three years at an artistic institution. My graphic designs for advertisements have been used in retail stores. In 1993, my husband found an ad in a magazine. Due to the superior customer service and wide selection of materials, I have stayed with Fire Mountain Gems and Beads® throughout all those years. As a loyal customer, I can see myself buying from Fire Mountain for years to come. In my spare time, I enjoy reading novels, dancing ballet, painting water colors and gardening pretty flowers. My jewelry designs are both my part-time career and also something I love to be immersed in to forget about all the stresses of the outside world. View all of Helen's designs in the Gallery of Designs.